COCO BEAN: Cinnamon Buns !! Oh yeah! This was my first EVER yeast bread experience. After tasting these succulent cinnamon buns I don’t know why I waited so long! I have to say, I was really afraid to make these since neither my 'Baking with Julia" nor any of my other cookbooks covered cinnamon buns. So I headed to the place that I had seen them made first, Smitten Kitchen. As with a lot of you out there, this was the first blog that I ever followed, but lately I haven’t been back (so many other blogs to check out). It was at an earlier Supper Club that someone alerted me to the buns, and the bun in HER oven (Congrats!). I was still a bit weary, especially since the 1055 comments on the buns post were all congratulations and not about the actual cinnamon rolls, so I headed to Smitten Kitchens source. Of course, it was Molly Wizenberg of Orangette, and the book I have been reading, "A Homemade Life". If you haven’t picked up this book, run to the bookstore right now. It is such a wonderful read and after every chapter she gives a mouth watering recipe. Anyways, back to the point, I read the 96 raving reviews and started. For some reason I thought that I would need a stand mixer so I employed the help of my friend Alex (yes, a man with a Kitchen Aid!). But even though Alex makes mounds of cookies each week he does NOT own measuring spoons or dry ingredient measuring cups, making the exact addition of 2-1/2 tsp of yeast tricky. This is a man who is doing his PhD in cell biology with yeast, so he should know that even 1/24th of a tsp. extra can mean hundreds of thousands more cells. Ug, but we had no choice and had to approximate it using a regular spoon. Everything I have learned in the past 4 years of lab work about precision went down the drain! Oh well, we got lucky and the dough still turned out great! When we served these at supper club they were highly praised, I will be making these again. 1. Make the full amount of sugar cinnamon filling, plus 1/2 more. 2. You don’t need a stand mixer, but if you have a friend with one it makes for a fun afternoon. 3. The best way to do a rise is to put the dough in a 150 degree oven for 30 min to an hour. 5. Use PYREX, I did a couple in a metal pan and the bottoms burnt so badly. Someone else in the 96 comments mentioned this also. She was right! 6. Use your favorite cream cheese; don’t worry if it’s the fluffy kind. I used the supper fluffy cream cheese and added 250g instead of 4oz. The glaze was perfect. I didn’t change much of the recipe besides the notes above, so please check it out at the Bon Appétit website; this recipe was created and written by Molly Wizenberg. Just click the link! Babes, I'll make you some more! Really want to pick up Molly's book for some poolside summer reading. Just finished Animal, Vegetable, Miracle and highly recommend it. Looks like you struck out with your first yeast experience.Bravo! Yum, they look delish, I feel like reaching out through the screen and grabbing one! Congrats on your first experience with yeast baking! By the way, my bf also works in a lab, and he's always *very* approximative when it comes to adding yeast to dough - as was I, the first time I made bread. Uh oh, When did I start working in a lab? Ohh, maybe its her ooother boyfriend hahahha. Grr, babe, you didn't read that right, it was Alex, not my other boyfriend who is named naI. I have said too much. I read Molly's book a few weeks ago and loved it, but I had to return it to the library so I didn't bake/cook any of her recipes. I'm jumping over to the original now though. Thanks and they look great! oneordinaryday - This recipe is an eating requirement for anyone not allergic to the ingredients. They really are great, and I cant wait to have some more soon. So, A Homemade Life is good? I must admit, I am intrigued by the book. I made cinnamon buns for the first time a few months ago and they were SO SO good! I actually made mine in the bread maker (the dough anyway) I may have to try these for next time. I am totally hooked!! Aimee: It is a great read. Personally I like the romantic idea of being in a kitchen, where you can see and share with the people around you. After reading kitchen confidential I started to realize that the world of professional cooking was terrible! Then I read Molly's book. She reminded me that we don’t all have to be in a restaurant kitchen to enjoy cooking. I saw the Animal, Vegetable, Miracle at the book store today and am going to pick it up next time I get down there. Thanks! Valerie: Thanks! That makes me feel better about the approximation of yeast. So you are saying that the deliciousness of those buns is reproducible, even without my CSI micropipette? YAY! One ordinary day: Oh, a fellow lover of this book, hurray! I know everyone is raving about it but there is good reason eh. I also haven't made anything from the book yet, but I am going to soon. I promise to get pics of it! Hilary: Yes, great book, I will lend it to you when you come to the supper club. (date not set!) But if you can't wait till you get to Montreal, go pick it up! NOO I have NOT heard back from TWD and I am really pissed. It has been a month! I have decided that I don't want to be in their club. I'm in for Sunday with Dories! Coco: I heard that you can make these in the bread maker; seriously anything that simplifies your life is worth it! I will make some this weekend ... thanks for sharing the links and the tips. have a great weekend les amis... I really appreciate your comments. REALLY. Hi.Its my first time here and I must tell you, you have really great photos and recipes. Happy weekend. 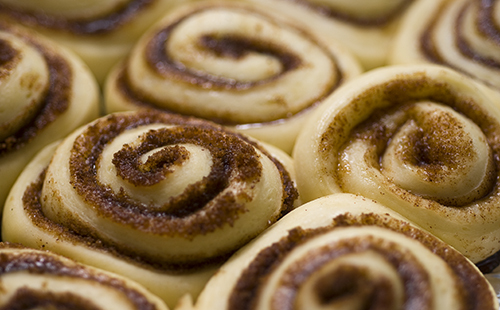 Theise little buddle of joy are not only sweetness wrapped in cinnamon. Fresh out of the oven they make one's mouth and tummy oooohhh so happy. And that's from a declared chocoalic. I recomand for all who are planning on making some that you mishape a few on every batch... Afer all what s the point of serving them to illustrious guests without quality control due proceses. Hint; apply quality control etiquette from the edges working your way in...MMMmmmmmmm !!! I love cinnamon buns! I've made them a while ago and they were so delicious! My favorite! I have had this recipe bookmarked for a while, but haven't made them yet. Yours look delicious!!! Heyy, I came across your blog in Tastespotting because your pictures just looked extremely delicious. But I have a few questions to ask as I've never worked with bread/buns. For the first rise do you mean before you knead the dough? and for the 2nd rise how long did you put it in the oven for? And did you just leave it in the oven for 150 deg until they were done? Hey Kenny: Sorry about that, I should have explained a rise. We use yeast a lot in the labs so here is a breakdown. When yeast is used in baking it eats the sugars and converts it to Carbon Dioxide.This makes the dough rise because the CO2 creates "pockets" of air in the dough. The first rise is done after the kneeding. The reason I put them in a 150 degree oven is because yeast really like to eat the sugars when they are warm. The 150 degree mark is the lowest that the oven heats and is usually used for warming foods so it won’t cook your dough. But, you will notice after 40 minutes that your dough has doubled in size. When you are ready to make the rolls you punch down the dough to let all the CO2 out. It will go back to regular size. Once you have formed the cinnamon rolls and put them into the baking dish they will look tiny and dense. This is where the second rise comes in. You put it in the 150 degree oven again for 40 min and they will puff up again to double their size, with air bubbles (CO2 bubbles) in them. 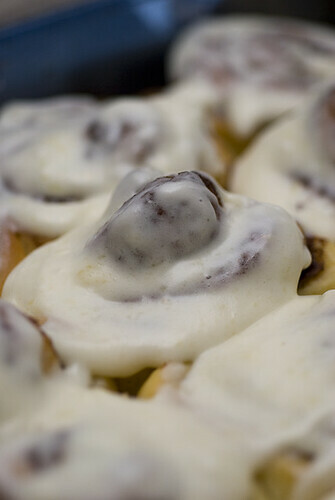 This makes the cinnamon rolls light and fluffy. Then you bake the rolls at 350 degrees and voila! Amazing rolls! I really hope that helps! Is this made with real Cinnamon or Cassia. Dimply Plum Cake -- Sundays with Dorie! Fluffy Cinnamon Rhubarb Muffins -- Lower Fat!